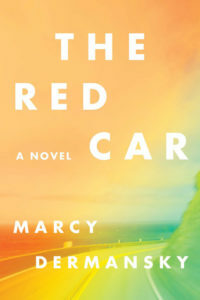 The Red Car by Marcy Dermansky is an odd little book, but a good one. Leah is a writer in her 30s, living in Astoria with her possessive German husband Hans. One day, she learns that Judy, her former boss during her stint in San Francisco a decade earlier, has died in a car accident. Leah had been close with Judy, and she is sad to learn that Judy has died. She also learns that Judy has left Leah her beloved red car – the same car she died in. Leah impulsively decides to go to the funeral in San Francisco and collect the car, and ends up spending two weeks there getting back in touch with her former self. Now, I know this sounds like a gauzy Lifetime movie: wise mentor challenges lost friend to find herself and rediscover joy, all from the grave. Nope. This is a quirky, dark, unpredictable book. Leah is lost, yes, but she’s also a little unhinged. She hooks up with random people in San Francisco, basically ends up giving away the car and avoids making any decisions about her life back at home. Meanwhile Judy flits in and out like a Greek chorus, commenting on what Leah is doing and alternately annoying and guiding Leah. The writing style in The Red Car is acerbic and a bit meandering, but also terse and compact. Leah is weird but totally relatable at the same time. Not a whole lot happens in this book, and the interactions Leah has are at times unrealistic and sort of unsatisfying, but as an exercise in getting inside someone’s head and exploring all the conflict and confusion there, The Red Car succeeds.